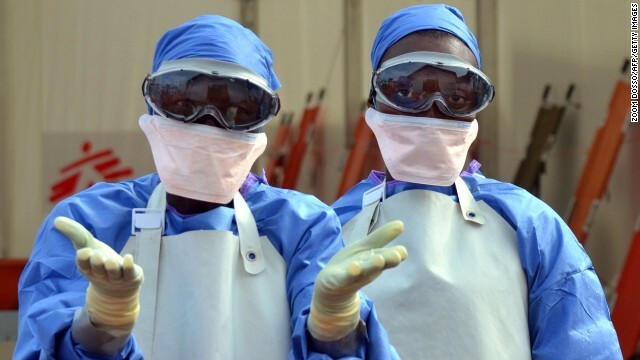 Health care workers in Liberia prepare to treat Ebola patients. The CDC issues new guidelines for treating Ebola. Oscar Pistorius is sentenced to five years in prison in the shooting death of his girlfriend. And the fashion world mourns a legend. Staying safe: Newly released Ebola guidelines by the Centers for Disease Control and Prevention focus on better protecting health care workers. More training and supervision are key elements, as is the requirement that no skin be exposed when workers are wearing personal protective equipment. Health care workers will also be drilled on how to put on and take off the gear. The CDC has been under fire since two Dallas nurses contracted the virus and dozens of other health care workers were put under a 21-day monitoring period for possible exposure to Ebola. Prison term: From a globally lauded athlete to convicted killer, Oscar Pistorius' fall from grace culminated today with a five-year sentence in the shooting death of his girlfriend. The sentence was imposed for the charge of culpable homicide, which in South Africa means a person was killed unintentionally, but unlawfully. He was also given a three-year sentence on a firearms charge, but it was suspended. State Prosecutor Gerrie Nel had asked for a minimum prison sentence of 10 years for Pistorius. There is no legal minimum sentence for culpable homicide in South African law, so the decision was up to the judge's discretion. Suspect may be a serial killer: The investigation of a man suspected in the deaths of at least seven women in northwest Indiana could expand to other states and stretch back decades, authorities say. Up to this point, Darren Deon Vann has been charged only in the death of 19-year-old Afrikka Hardy, whose body was found in a Motel 6 in Hammond over the weekend, Hammond Police Chief John Doughty said. But officials in neighboring city of Gary say there's much more to this case. The bodies of six other women have been found there. Several police agencies are now working the case, which could grow larger and expand to at least one other state, they say. World of fashion mourns: Legendary fashion designer Oscar de la Renta, who spent half a century putting high society in haute couture, has died. He was 82. The man - often described as the "sultan of suave" - not only dressed every first lady since Jacqueline Kennedy, but designed the wedding dresses for many of their children as well, including Jenna Bush and Chelsea Clinton. The cause of his death was not immediately clear, but he was diagnosed with cancer in 2006. Stepping out socially: Monica Lewinsky has a new mission in life: to end cyberbullying. The former White House intern, who had an affair with President Bill Clinton in 1995, said she was "patient zero" in online harassment and wants to help others with her survivor's tale. "There was no Facebook, Twitter or Instagram back then. But there were gossip, news and entertainment websites replete with comment sections and emails which could be forwarded," she said yesterday at the Forbes' 30 Under 30 summit. "A viral phenomenon that, you could argue, was the first moment of truly 'social media.' " Lewinsky's speech came on the same day that she joined Twitter. A little hair of the dog, it would seem. - Racing drones: These quadcopters flying through the woods look like something out of "Star Wars." Isn't technology a wonderful thing? - This takes some guts: A Washington state citizen pulls over a cop and gives him a warning for operating an unmarked vehicle. Our video vigilante says it's against the law. The officer takes it in stride. - No fear: This little guy throws himself into the ball pit with plenty of gusto. - Fancy feline: Is it just us, or is it creepy for a cat to be walking upright? - Marcel the Shell: If you're not familiar with Marcel, he's a children's book character. We think it's kind of cute, if you don't watch it too long. WOW!!!!!!!! OMG!!!!!!!! LOL!!!!!!!! REALLY?!?!?!?!?!?!?!?! Marcel the Shell. What is the attention span of the child? I liked the new lady on this morning she did an excellent job.